Backup to stay unaffected by ransomware should be the smartest way. If your computer attacked by ransomware, you can use the backup to retrieve your data immediately. Ransomware becomes a hot topic recently, because of the new ransomware WannaCry. Ransomware has been defined as a type of malware that carries out the cryptoviral extortion attack from cryptovirology that blocks access to data, and demands a ransom for decryption message to unlock the files encrypted. For example, recently, the prevailing ransomware WannaCry is such a ransomware that once inflected, the files will be encrypted, and the criminals behind it will demand a certain bitcoin (usually worth $300) to recover all your files. The WannaCry Ransomware made a huge influence around the world. Meanwhile, it put the topic “how to defense against ransomware” in the highest wave. 1. Use some software like Windows Defender, MBAM free, WinPatrol free to prevent from ransomware attack. 2. Be suspicious of emails, websites, applications. 3. Always install updates, update your operating system, software, apps frequently. 4. Block Windows port 445 or other port. You can search a lot of ways to stay unaffected by ransomware. However, there is not a 100 percent guarantee that after done the things, your computer will not be attacked by ransomware. Thus, backup, becomes the smartest way to stay unaffected by ransomware. Why backup is the best smartest way to stay unaffected by ransomware? You may asked like that. Ransomware will attack your computer and encrypt your operating system or important files for ransom money. 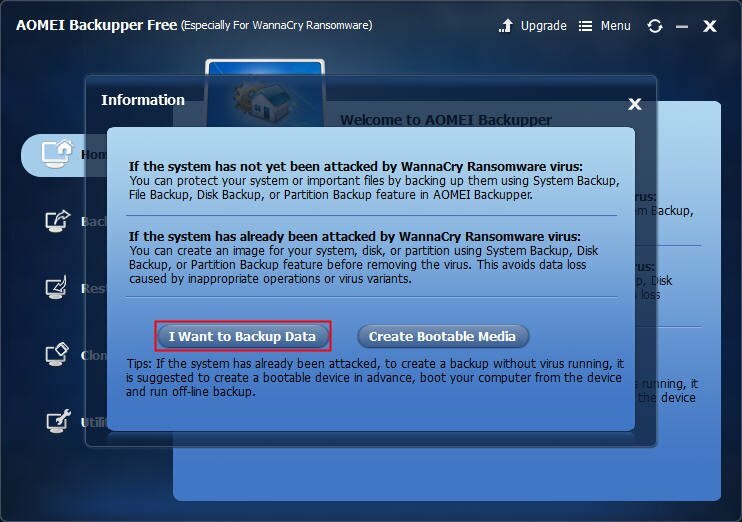 Like the recent WannaCry ransomware, if your computer inflected by it, and you backed files up before, you will be umaffected by ransomware--you can just remove the ransomware and delete the encrypted files, then, recover files from the backup image directly. The ransomware will not affect you and you can ignore the ransom silently. But how to backup to protect data safe from ransomware? First, you need to figure out what should you backup. Indubitable, your personal files should be backed up, cause they are irreplaceable. Besides, it is necessary to backup system if you do not want to reinstall OS when you meet some inevitable situations. Tips: WannaCry ransomware will only encrypt important data, like documents, pictures, or other data, it won’t encrypt the folder under the root directories of C:\ drive like Windows, Program files, etc. So here we do not need to backup system. Actually, speaking of backup to defense against ransomware, the AOMEI Backupper Free will help a lot. AOMEI Backupper Free is a freeware especially designed for WannaCry and other ransomware. No matter your PC is affected or unaffected, you can use it to backup data onsite or offsite for you. 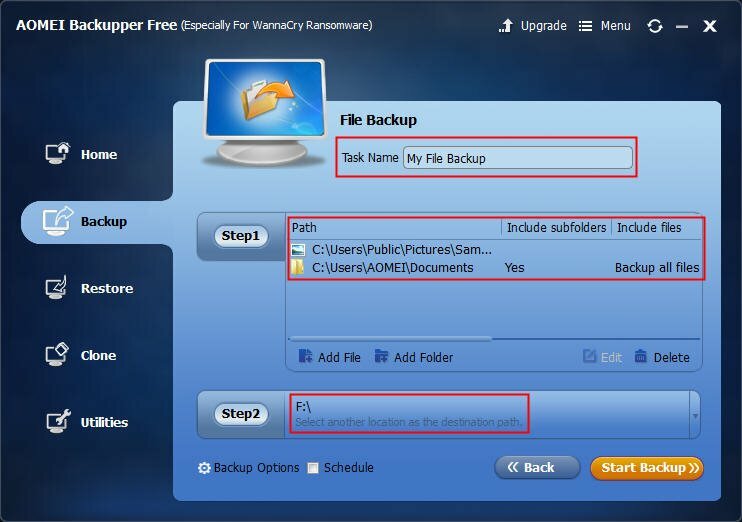 Install your external hard drive to your PC, and download AOMEI Backupper Free. 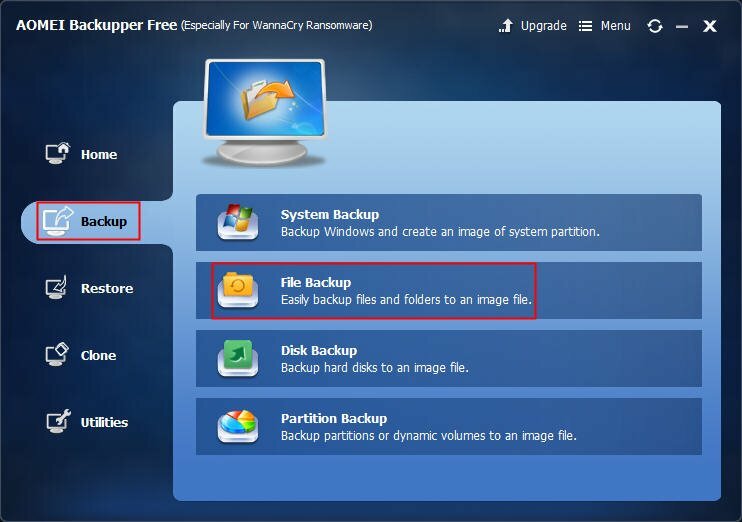 If your PC is unaffected, you can use it to backup data to external hard drive directly. Step1. Select I Want to Backup. Step2.Then, it will show you a concise interface, select File Backup. Step3.Choose the files/folders you need to backup at Step1, and choose the external hard drive your prepared as the destination disk at the Step2. Step4. Before clicking Start Backup, you can clickSchedule option to set up an automatic backup for daily, weekly, monthly instead of backup manually. After all settings, clickStart Backup and wait till the progress reaches 100%. 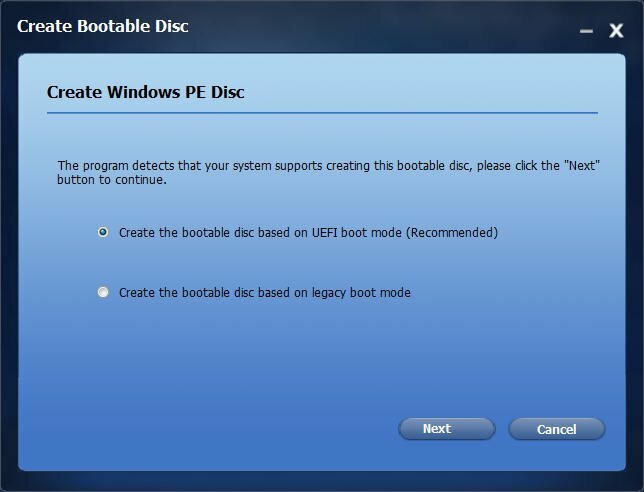 If your PC is affected, you can select Create Bootable Media to create a bootable media first. Then, it will show you the wizard of create bootable disc. Select one (recommended) and click Next. 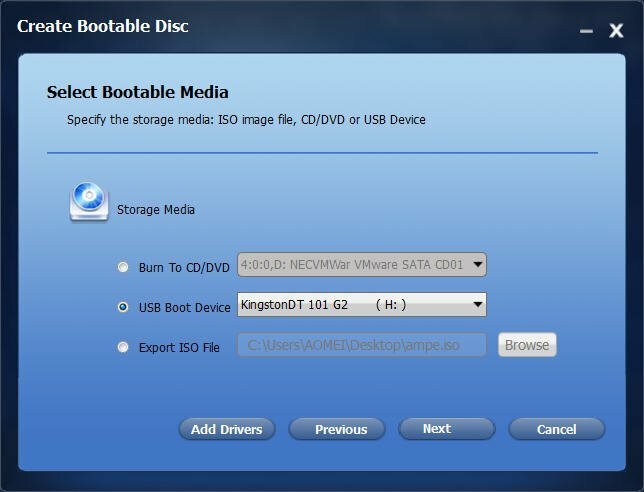 Here you can specify the storage media: ISO image file, CD/DVD or USB Device. Here is creating a USB Boot Device. Click Next. It will create a bootable USB drive. 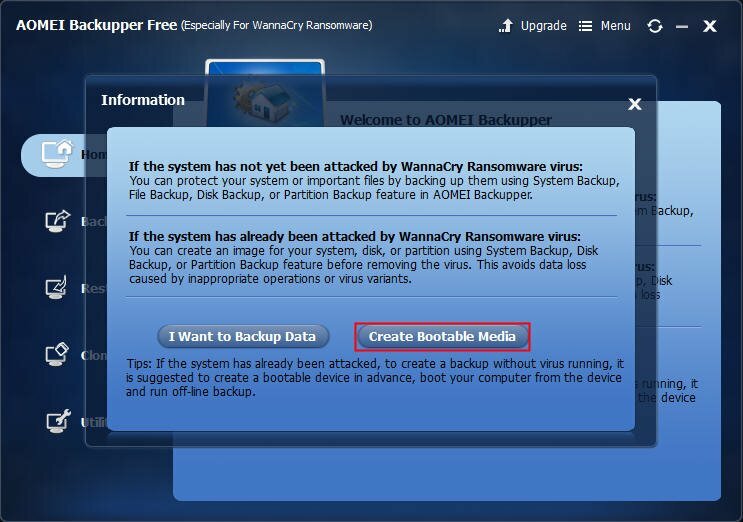 And you can boot your computer from the bootble USB and backup data to external hard drive with AOMEI Backup Free. No one can promise that there will not appear ransomware anymore. Backup should be the smartest way to stay unaffected by ransomware, no matter what kind of ransomware. With the backup, you can restore data once you attacked by ransomware.